Like the wheels it rides on, no one needs to reinvent the compact SUV. A practical car for practical people, it has supplanted the four-door sedan and station wagon in recent years as the starter vehicle of choice for many newlyweds and young families — roomier and more versatile than the former, sportier and better on fuel economy than the latter. It’s one reason why I never quite understood the appeal of the luxury compact SUV: the class exists to give budget-conscious buyers a little more bang (and cargo space, and utility) for their buck, and the differences between so-called “luxury” editions and more economic ones are negligible. If you want to spend more than $30k on a grocery getter, opt for a German sport wagon or size up to a standard SUV from a Japanese or American marque, both vehicle classes where you’ll actually see a big boost in performance. Otherwise, get something dependable but inexpensive, and then start saving up for one of those. Something like the Chevy Equinox, a formerly plus-size crossover that trimmed things down for its — vastly improved — third edition. Where we drove it: New York to Virginia and back, on both highways and country roads, fall foliage glimmering in the backgroud. Our first impression, in three words: Bigger than expected (followed immediately by “That’s what she said!”). Tell me about the boring stuff under the hood: If you’re looking for a 10-second car, you came to the wrong party. The standard engine is a 170-horsepower turbocharged inline four-cylinder, though you can (and should) bump things up to the premium 2.0L turbocharged I4, which will get you 252 ponies — nearly on par with the 237 ponies of the buzziest new entrant in the compact SUV class in 2017, the Land Rover Evoque. How much does a Land Rover Evoque cost? Starts at $42,000. But the sticker goes up rather steeply as soon as you start adding options. And how much does an absolutely fully loaded Equinox cost? Around $35,000. So which one’s better? Depends. Do you care about comfort and performance, or being able to tell people you drive a Land Rover? How does it drive in the city? Your correspondent lives in New York City. The worst part about driving in New York City is the city’s narrowness: lanes are small, and between double-parkers, cyclists and taxis who weave in and out of lanes like short-track speed skaters, you’ve got to be constantly vigilant to avoid collisions. 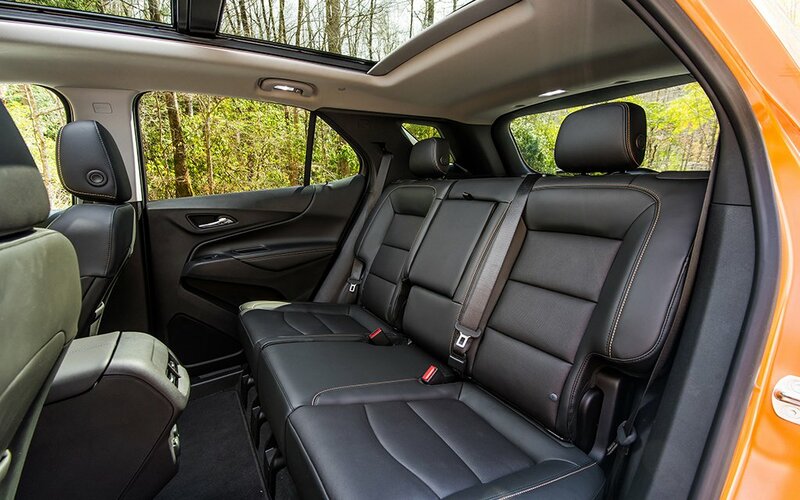 That makes the newly downsized Equinox a great fit for city driving: it’s manageable and maneuverable, and safety options like a surround-view camera, collision warning, automatic low-speed braking and a vibrating in-seat alert system have your six at all times. What do you mean by “newly downsized”? One of the biggest complaints about the first two generations of the Equinox was that they were too bulky for the compact SUV category. 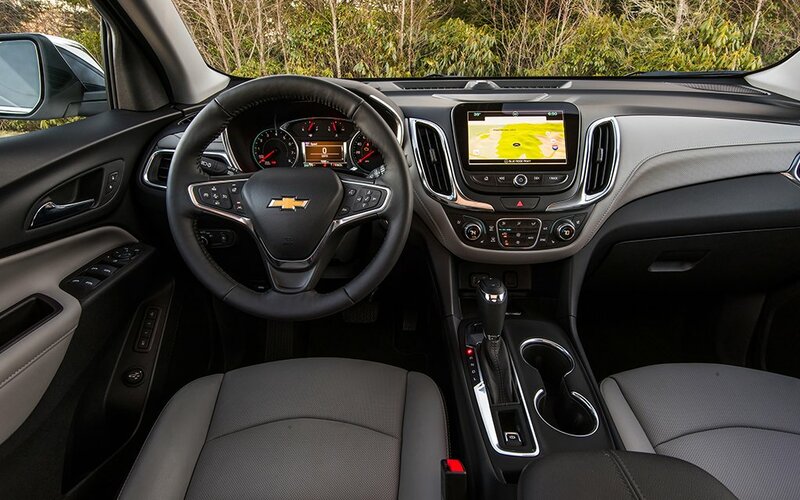 So for the 2018 — and first third-generation — Equinox, Chevy took four inches and an eyebrow-raising 400 pounds off the platform. Does that mean less legroom or cargo space? Astonishingly, not really. No seat lost more than three-tenths of an inch of legroom, and the total passenger volume actually increased by 3.5 feet. But let’s be honest: cargo volume is really the name of the game with the compact SUV. With the back seat up, you get 30 cubic feet. 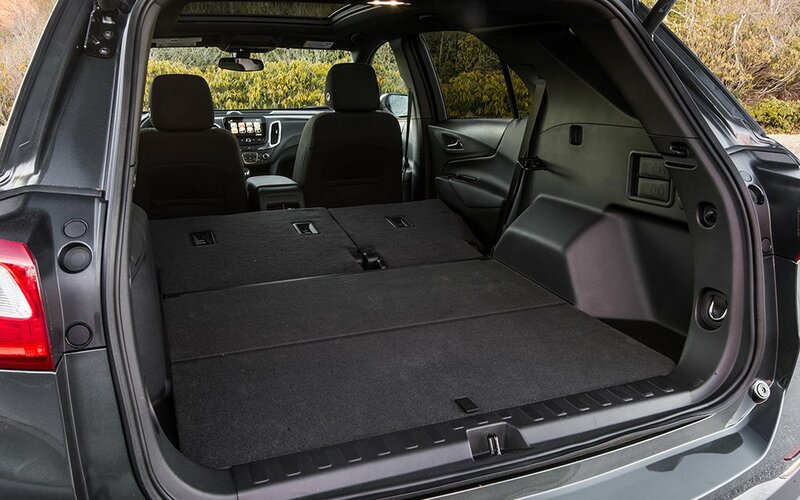 But that back seat also seamlessly stows to give you a flat, continuous, moving van-style cargo hold of 63.5 cubic feet. I’m not a numbers person. What can that actually hold? In your correspondent’s case, two suitcases, a full-sized Doberman and her XL collapsible crate, which he’s had trouble fitting in both wagons and compact SUVs in the past. What else does the smaller size mean? Improved fuel economy (30 MPG highway; 24 city) and more agile handling. It holds its own with the Ford Escape and Honda CR-V, largely considered to be the cream of this class. Any drawbacks? Why GM is still insisting on equipping their vehicles with OnStar is beyond us. The emergency-assistance feature obviously has its appeal, but as a navigation tool, OnStar is wonky, slow and wildly inferior to a number of nav apps you can download on your smartphone. Final impression, in three words: Ideal newlywed mobile.